QE2 enthusiast Rob Lightbody has filmed inside the former Cunard liner which has been moored at a dockside in Dubai since leaving its former home port of Southampton. 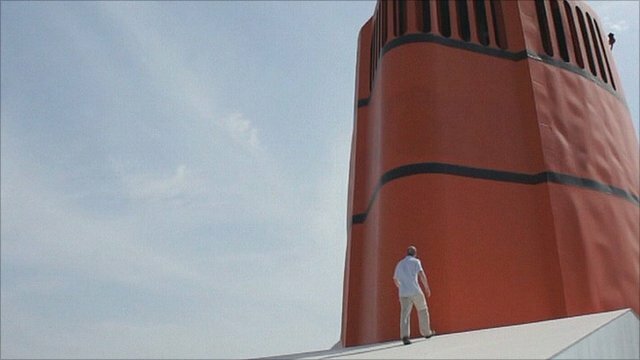 It is thought to be the first footage shot inside the famous liner since 2008 when United Arab Emirates real estate developer Nakheel bought the ship for $100m. Following the global economic downturn, the plans to convert the ship into a floating 200-room luxury hotel and entertainment centre off Dubai's manmade islands came to nothing. A captain and a skeleton crew of 38 remain onboard to paint and maintain the ship. It is thought unlikely the former Cunard flagship - which carried almost 2.5 million passengers and completed over 800 Atlantic crossings - could now sail under its own power. Play Gay in Northern Ireland: "I felt dirty, I felt less than"
Watch How secure can public places be? Watch Ben Nevis: How high now? Watch What's the best way for firms to expand? Watch Can technology cut corruption in India? Watch Fancy a bit of art with that?